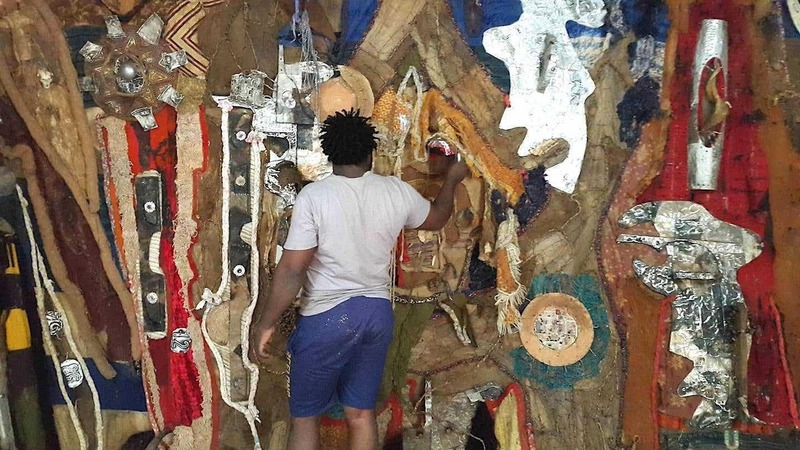 Experience creating your own sculptural work with the guidance of Jean Michel Dissake, Cameroonian artist-in-residence. Learn about Jean Michel’s work and his message about unity and realizing our oneness with nature. Materials from the Scrap Exchange will be available and please also bring your own found or recycled materials (aluminum, plastic, fiber, other objects) to work with. Wire, glue, thread and hammers are provided; please bring work gloves. Registration is required. Space is limited. Jean Michel Dissake, artist from Cameroon, will be in residence at the Scrap Exchange Monday, Feb. 25 through Saturday, March 2.Jean Michel is an extraordinary artist who uses found and recycled materials to create sculptures that may include wood, vines, termite dust, fabric and other natural objects with wire, aluminum, computer parts and recycled materials. His concepts and message are a powerful message about unity, reconnecting with nature, finding a balance with nature and technology and “healing the Tree of Life.” Africa News calls Jean Michel‘s art “…new sculptural forms and an ecological discourse.” ‘Cameroun : des objets d’art à partir de matériaux récupérés’, Africa News 2017, https://www.youtube.com/watch?v=hKXByMWtPDc Please feel free to come to the Scrap Exchange and meet Jean Michel during his residency!